Nine Mornings is now the number one festival in St Vincent and the Grenadines even surpassing Vincy Mas in visitor arrivals. Peters said although General Elections were held during the Christmas season last year, the festival still saw a higher amount of visitors compared to the carnival season. He said that Nine Mornings was a festival where both Christians and non-Christians, young and the old could gather to have good clean fun while recognizing the birth of Jesus Christ. He also stressed that there would be no alcoholic drinks on sale during the Nine Morning festivities and that no intoxicated persons would be allowed to perform on stage. The Cultural Officer noted that countries like Barbados and St Lucia seem to be following the unique Vincentian tradition where people come out at 4 am to worship services, concerts and play games to celebrate the birth of Jesus Christ. 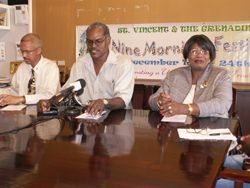 Minister of Culture Rene Baptiste has called on the media to give more promotion to the Nine Morning festivities which officially launch on Sunday December 3. Baptiste announced that on December 10 a feature on Nine Mornings will be aired on the Travel Channel from 8-10 pm. She said that while other countries have realized the importance of Christmas festivities such as Nine Mornings, the local media was not doing enough to show their patriotism by promoting it. The Culture Minister said that it was time for Vincentians and the local media to show more self worth and to embrace their own. Baptiste also pleaded with the businesses to show some generosity during this season since Christmas was the season of giving. Admitting that the government was guilty of not doing enough to beautify some of itâs own buildings, the former Tourism Minister also called on owners around the city to clean up, paint and decorate their buildings so that the country would reflect the pride it has in itself. The first item on the agenda is the Schools Christmas festival being held today with Chateaubelair Methodistâs production entitled, âWhen Yo Laughâ at the Peace Memorial Hall. While tomorrow the National Broadcasting Corporation would host their charity event called âCommunity Affair at the Car Parkâ. Nine mornings would be officially launched on Sunday December 3 at Heritage Square from 7 pm. The Nine Mornings festivities operate with a budget of $237,050.